BD Becton Dickinson Phoenix 100 Incubator Bioreactor Colony Microbiology Culture . New Life Scientific, Inc. 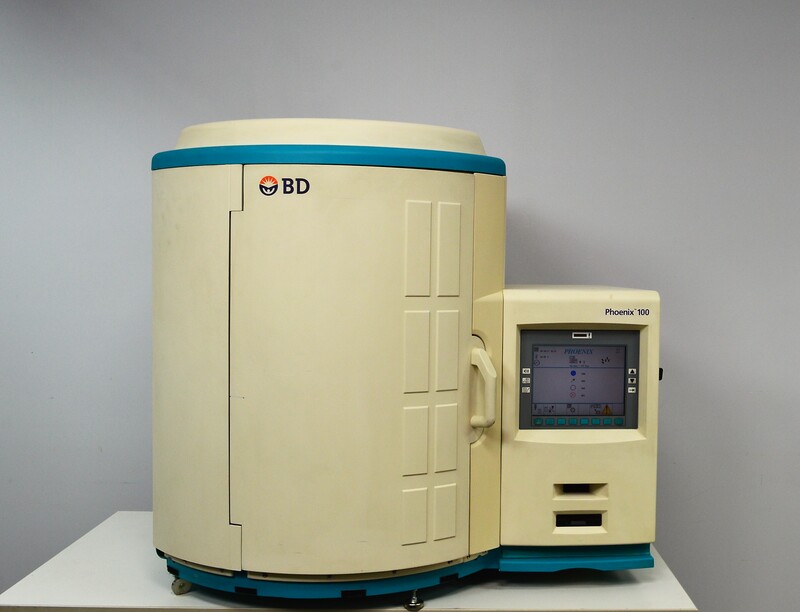 The Becton Dickinson Phoenix 100 is an automated microbiology system that allows the user to identify and monitor antimicrobial susceptibility, employing sensors and multiple detection methods for the viability of microbial broths. If you are interested in more information about the Phoenix, please refer to the brochure here. This is a used BD Phoenix 100 system that is in good cosmetic condition. There is a trim panel missing that only improves the aesthetic value of the equipment. The staff replaced one 'foot' because it was bent in transportation. All obvious paint scuffs or blemishes are documented in the photo gallery. NLS powered the instrument on and noted that the system boots without errors, until the chamber was opened. Unfortunately, the technicians do not stock the reagents and consumables ideal for testing this type of equipment and are unable to run samples for precision or accuracy. A sample tray had lodged itself between the carousel and wall which was promptly removed. The door latch was replaced by the previous owner and requires much more force to open than the Phoenix 100 previously acquired by NLS making it somewhat difficult to open. This product was not fully tested and will be sold as-is. The configuration menu was accessed using the password 'admin,' but other areas of the program were not accessible such as look-up/search which were navigable in previous Phoenix systems acquired. For more information, please use the link provided and contact New Life Scientific for warranty details.